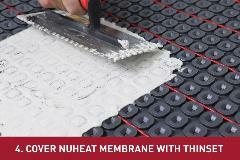 Nuheat Membrane significantly decreases the time, difficulty, floor height, weight, & cost of your installation. 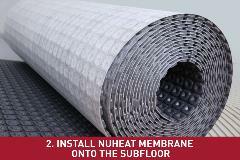 Nuheat Membrane is a tile underlayment that can be installed over the entire subfloor for uncoupling, crack isolation and waterproofing purposes. It replaces the need for a second layer of plywood or concrete backer board in most tile installations. The polypropylene plastic layer features square-shaped columns which form channels specially designed to embed and hold Nuheat Cable. The shape of Nuheat Membrane also functions as a vapor management system that allows moisture to escape from the substrate during the curing process. It's polypropylene layer is heat-welded to a non-woven polypropylene fabric that absorbs thinset and creates a strong bond to the subfloor. 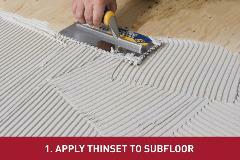 The Nuheat Membrane product is simply adhered to the subfloor using thinset. 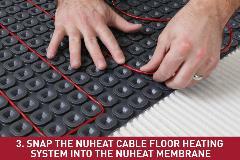 Next, snap in the Nuheat Cable Floor Heating System into the channels of the Nuheat Membrane based on the area you want to heat. 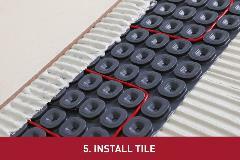 Cover the Nuheat Membrane and Nuheat Cable with thinset and tile can be installed over top.